Dice.com, a career website that serves professionals, has created a game portal to add engagement for their existing users and entice new ones. The game portal has a retro theme and so do the games the users can play. It also has a leaderboard and registration. Prizes are up for grabs and the users who get the highest scores for each game will receive a bundle of amazing retro-themed items. Although all users across the world can play the games, the prizes are only eligible for those who live in the UK. All of the included games in the game portal are developed using HTML5 technology, which means they can be played on almost every web browsers without the need for any plugins. Trixology – a simple puzzle game that is inspired by Tetris. Fit the puzzle pieces into one horizontal tile to clear them. Soccer Pro – an 8-bit endless runner with football. Avoid being tackled by your opponents and score as many goals as you can. Zero Collision – a driving game very similar to Dodge ‘Em. Avoid incoming cars by quickly switching from one lane to another. Leave Me Alone – a zombie defense game. Defeat the endless stream of zombies coming from the four directions by delivering ninja punches! 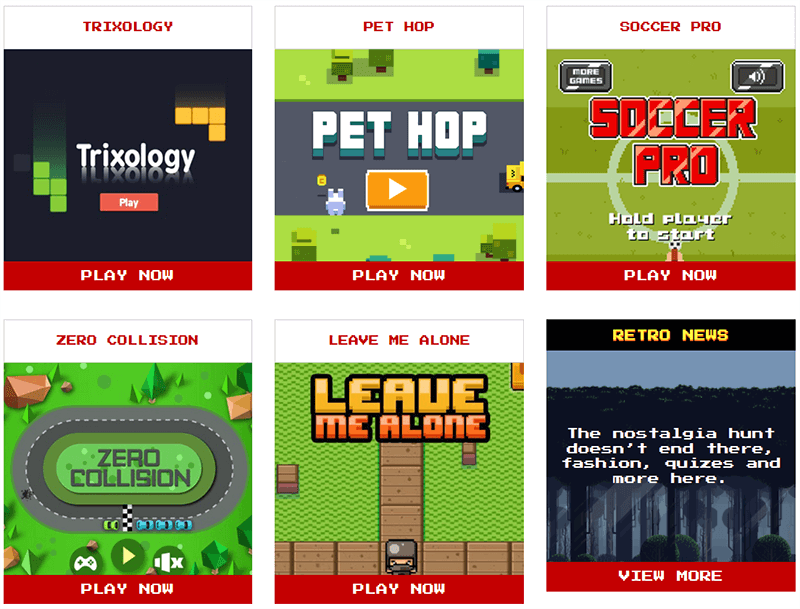 Pet Hop – an “endless frogger” game. Help the pet of your liking hop their way across traffic and avoid getting hit by cars and falling off the water. Do you have what it takes to get the high score? Feel free to try here! To know more about the game portal, read the in-depth case study here.